Mercury's magnetic field mapped by MESSENGER. New data from NASA's MESSENGER probe, the spacecraft that orbited Mercury for four years before it crashed into the planet in April 2015, reveal that Mercury’s magnetic field is almost four billion years old. MESSENGER left Earth in 2004, flew by Mercury for the first time in 2008, and had orbited the planet since 2011. MESSENGER was the first spacecraft ever to orbit the planet Mercury, and data from the spacecraft's seven scientific instruments continue to help scientists unravel the history and evolution of the closest planet to the Sun. Researchers used data obtained by MESSENGER in the fall of 2014 and early 2015 when the probe flew incredibly close to the planet’s surface – at altitudes as low as 15 kilometers. In the years prior, MESSENGER’s lowest altitudes were between 200 and 500 kilometers. When MESSENGER flew close to the planet, its magnetometer collected data on the magnetism of rocks in Mercury’s surface. Those tiny signals revealed that Mercury’s magnetic field is very ancient, at least 3.7 to 3.9 billion years old. The planet itself formed around the same time as Earth, just over 4.5 billion years ago. A study detailing the planet’s ancient magnetic field was recently published in Science Express. Mercury is the only other planet besides Earth in the inner solar system with such a magnetic field. Scientists have known for some time that Mercury has a magnetic field similar to Earth’s, but much weaker. The motion of liquid iron deep inside the planet’s core generates the field. There is evidence that Mars once had a magnetic field - but it disappeared at some point more than 3 billion years ago. 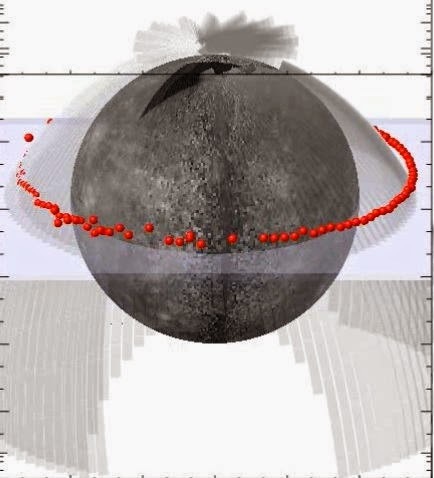 This video shows the location of Mercury's magnetic equator determined on successive orbits by the MESSENGER spacecraft.